Alpha, beta and gamma radiation have very different properties in penetrating through materials and being absorbed by them. 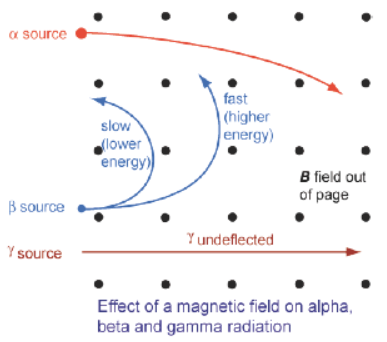 The energies of each type of radiation varies depending on the source, therefore every alpha source is not exactly the same and this variation also applies to beta and gamma. However the difference between alpha and beta and between beta and gamma is very large. 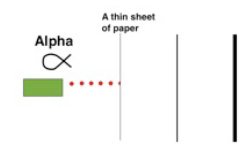 Alpha radiation is absorbed by 20 to 50 mm of air or a thin sheet of paper. Beta radiation is absorbed by around 3mm of plywood or 1mm of aluminium. It has a range of about 300mm in air. The intensity of gamma is reduced after passing through one sheet of lead. If the lead is 10mm thick the intensity will be reduced to about half. Passing through similar sheets it may halve it again and again and again - but does not completely disappear. Gamma radiation has effectively an infinite range in air. All ionising radiation like alpha, beta and gamma causes damage to living material and is best avoided so far as you can. Ionisation is the removal or addition of electrons as the radiation strikes or passes close by atoms. Alpha particles are big and have a charge of 2+ which is the reason why the range is generally small. You can protect from alpha by just a thin layer of material or by being more that 100mm away. However, if an alpha source is next to you skin or worse you breathe it or swallow it then it causes cells a great deal of damage. As it passes through body tissues it causes ionisation of a large number of atoms and is likely to kill cells. 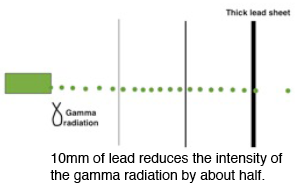 Beta radiation requires a thicker layer of material to stop it and a larger distance in air however the ionising effect is much less than alpha. The intensity of all radiation falls according to the inverse square law therefore the further you are from a source the better. That means if you step away to twice the distance the intensity falls to a quarter. Distance is often the best safety measure. Alpha is attracted to the negative/ repelled by the positive so it has a positive charge. Beta is oppositely/ negatively charged so it is attracted to the positive plate. The path they take in the electric field is parabolic because the force is constant and in one direction. 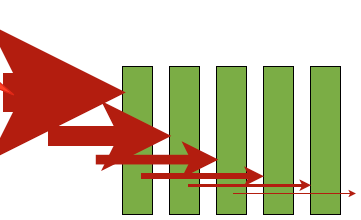 The deflection of alpha in the diagram is exaggerated. Beta has only half the charge of alpha but it is deflected far more because beta has a much smaller mass (about 1/8000). Gamma radiation is unaffected by an electric field because it is not charged. The alpha and beta particles deflect in a circular path because the force is constant and always at right angles to the direction of movement and to the magnetic field. 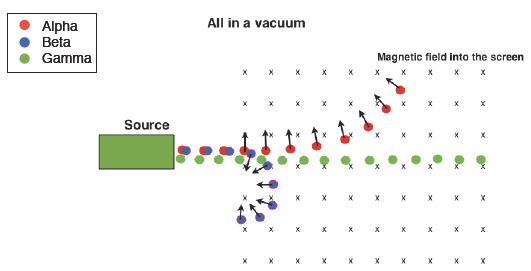 Again even though the alpha particles have a greater charge than beta (2+ for alpha 1- for beta), they are deflected much less because the mass is far greater. If the magnetic field is coming out of the page our view of the deflection is reversed. 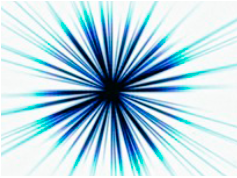 If the particles are travelling faster they deflect less.